You are here: Home / Blog / Adventures in RVing: The Birds! Adventures in RVing: The Birds! If you have been following my blog for long, you know I like my campsites to be as wild and spacious as possible. After all, that is what camping is all about – getting away from it all. Boondocking is my first choice of campsite, second choice government (county, state or federal) campgrounds, third choice private RV parks. I have nothing against private RV park owners, I just like spacious sites and most private RV park owners cannot afford to provide large RV sites and pay their property taxes, too. So when my wife and I wanted to spend a day in San Francisco, the search was on for a campsite within a reasonable driving distance of the City by the Bay. Due to population density and the lack of wide open public land, boondocking was not an option. White checking publically owned campgrounds, I stumbled across Lake Solano County Park near Winters, California, a little over an hour’s drive from San Francisco. Using Google Earth, I was able to see the campground was on a body of water and offered spacious campsites under large shade trees. 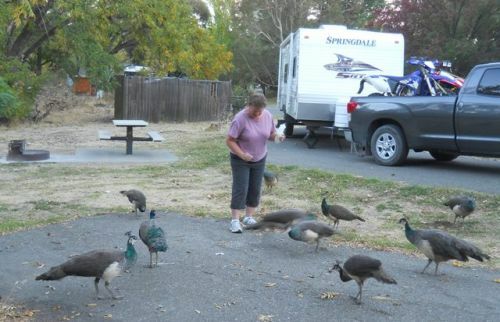 Upon arriving and circling the campground loops to select the best available campsite, we noticed a beautiful male peacock perched on a picnic table, then another, then a flock of them gathered around an RV where they were being fed by the RV’s owner. I have never seen so many peacocks gathered together. Childhood memories of peacocks near my grandparents’ ranch reminded me that the bird could be quite vocal especially in the morning. I began to second guess my decision to camp here. Scores of noisy birds roaming all over the place, visions of Alfred Hitchcock’s horror movie The Birds soon came to mind! I am happy to report that after camping with the birds for two days, the peacocks were quiet and quite sociable, too. I was looking for a wild spacious place to camp and Lake Solano County Park delivered! Camping with a flock of peacocks, just another adventure in RVing. Oh, I almost forgot. If you decide to feed them, don’t forget to close your RV screen door! Enough said!